After many years of great service it was decided to retire the old Astwood Bank Carnival logo and design one that helped celebrate the diverse range of events that takes place throughout the year, all organised under the umbrella of Astwood Bank Carnival committee. And so for an organisation that is all about supporting its local community, what better way than to go and ask the children of Astwood Bank for their ideas. 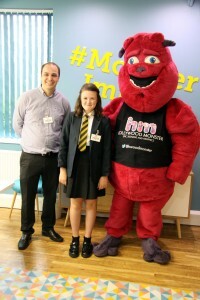 So working closely with Birmingham based Hollywood Monster signage and graphics company a competition was launched. The main prize for the winner being a day out at Hollywood Monster so they could see how their initial design was brought to life by a professional graphics designer. A panel from the Carnival committee reviewed all entries and announced the winner to be Olivia Bevan a student in year 6 at Ridgeway Academy. Olivia recently had a great day out at Hollywood Monster with professional designer Emma Hyland. Olivia’s idea were transformed into a logo that will be suitable for Astwood Bank Carnival events for years to come. What did the new design look like, well you’ll have to wait until it gets revealed to the crowds at Astwood Bank Carnival on Saturday 9th July.